With a very defined set of tasks we needed to get through on the day and a small crew, I was thankful that the weather was perfect for our working bee at Mt Rosea. That of course meant it was also perfect climbing weather but hey, there are plenty of perfect climbing weather days in the year ahead. 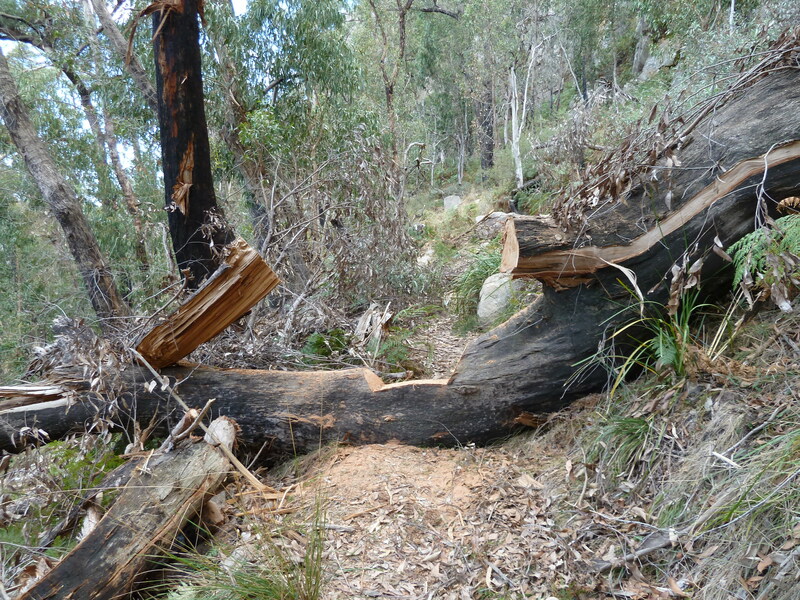 Clearing of fallen trees and branches and delineation of track before last switchback. By the time we had all gathered, tools collected from the depot and entered through the gated road to the Rosea carpark it was about 9.30. With 10 people in total this meant that I could assign 4 people to the two main work areas to tackle the jobs. 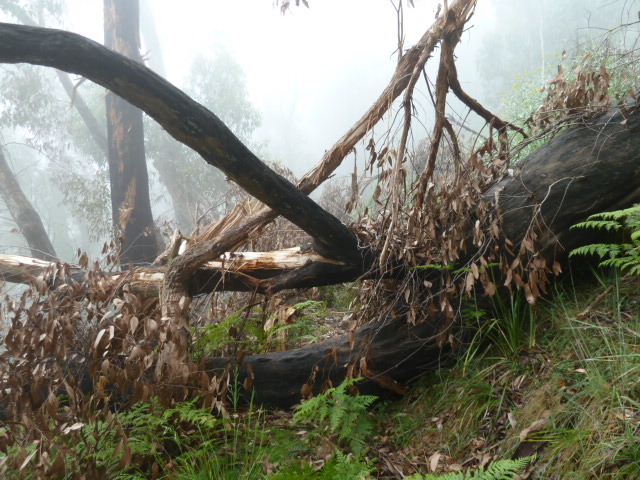 The landslide track area being one and the second treefall area near the last switchback which had also taken out the track a bit. 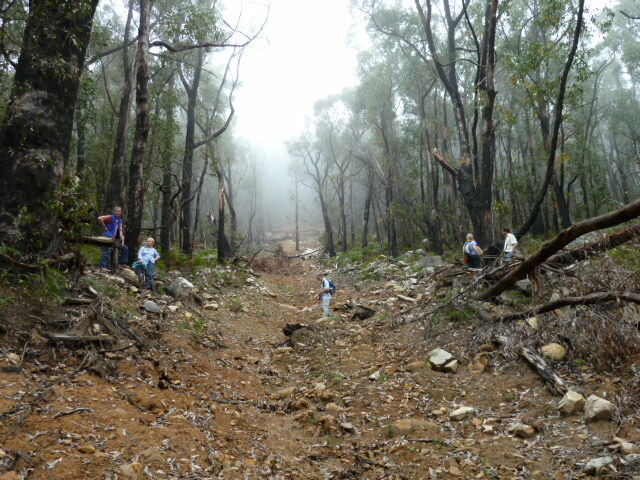 Frank,Cam,James and Ben took charge of the landslide gully and David,John, Sean(MUMC) and Gaeton(MUMC) . Sylvia and myself took on the job of clearing some of the track sections of overgrown bracken. A particularly exciting aspect for me (yes, sad I know) with this working bee was that we had our very own chainsaw wielding climber volunteer. All properly accredited – which is basically the only way we can have our very own chainsaw wielding maniac volunteer on PV managed land. With David along it meant that we could get the trees across the track sorted then and there and be able to complete the work how we needed to. He did a brilliant job quickly – I would have hated to see how long it would have taken with handsaws and there was no way with the small team we had that we would have got through the work. The landslide gully was a difficult one to figure out. Even in the time since I last inspected it, the gully has deepened. Our original thoughts to put water bars further up above the track in order to divert water off the new segment of the climbers track that has been delineated and stabilized, needed to be reassessed. 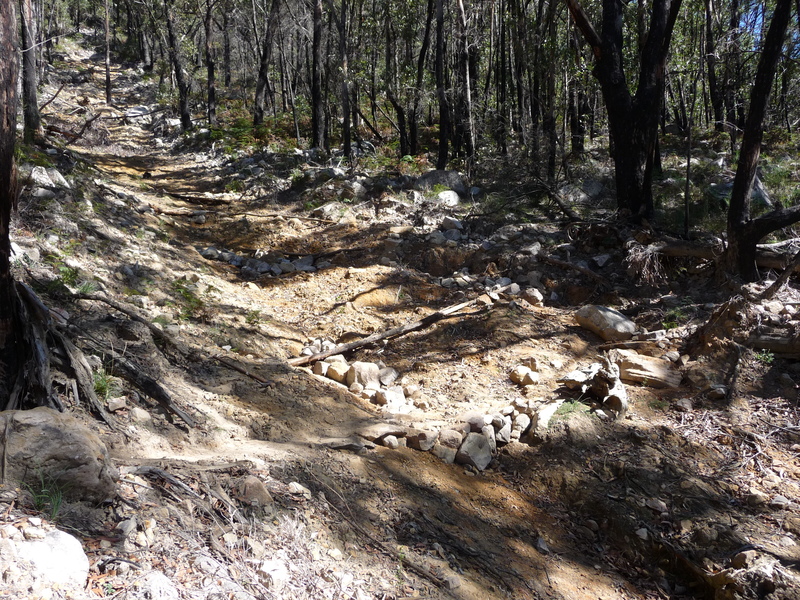 Not strictly water bars – this would have involved building up the gully too much, the decision made by Frank, Cam,James and Ben was to construct a 4 tier diversion by filling in tiers across the gully with large rocks and boulders. The hope is that this will slow and divert some water off our track section. This repair is for normal rain and water runoff not a flood event. 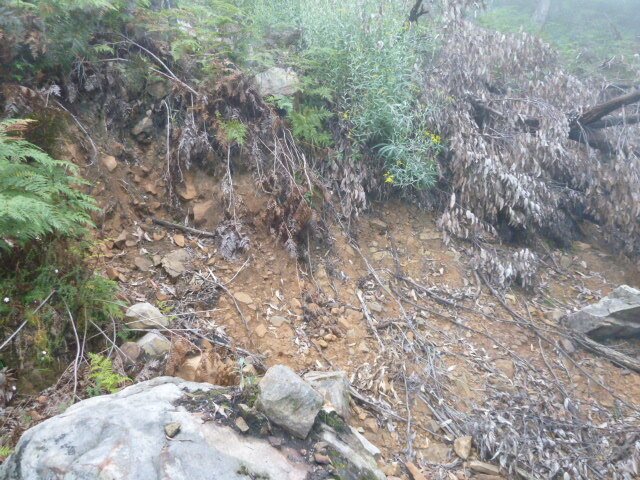 Some of the gully is still loose in sections and I’m quite sure we will need to revisit and rework bits here and there. The following pictures before and after will give you an idea of the work that has been done. 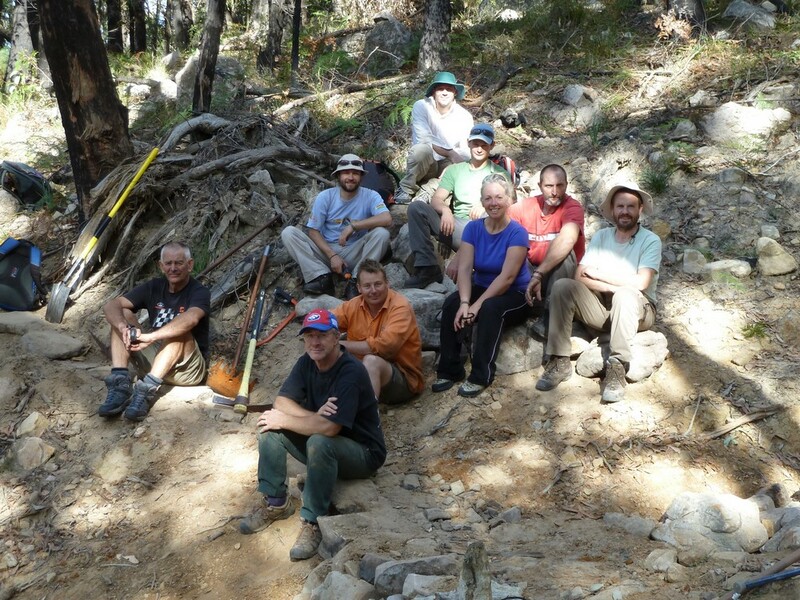 As always, a massive thankyou to the volunteers who took the time and gave up their time to look after our side of the bargain with Mt Rosea and the climbers access track. 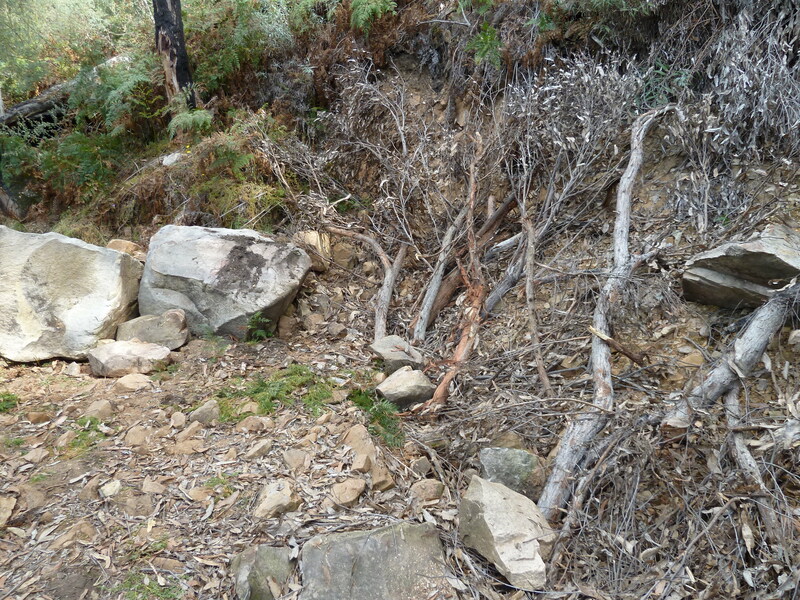 This entry was posted in Access &Environment officer reports, Grampians and tagged cliffcare, grampians, mt rosea, volunteers erosion by Tracey. Bookmark the permalink.